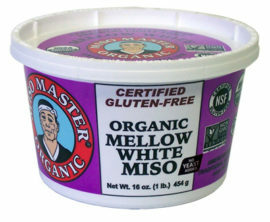 Miso Master Organic Traditional Country Barley Miso is considered a Long-Term miso. It is aged naturally without temperature control for 18 months through four seasons in giant four-ton, hand-crafted Cypress, Redwood, or Fir barrels. It has a high soybean con­tent in relation to the barley koji (grain inoculated with aspergillus spores). Because soy­beans are much more difficult to ferment, with their high protein and fat content, than the high-carbohydrate grains, this miso variety requires a prolonged aging period. This gives the aspergillus spores and lactobacillus bacteria sufficient time to completely break down the complex protein and fat molecules into their more digestible constituents. Aged a minimum of 18 months. 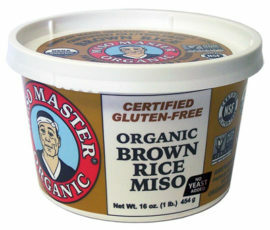 Miso Master Organic Traditional Country Barley Miso is considered a Long-Term miso. It is aged naturally without temperature control for a minimum of 18 months through four seasons in giant four-ton, hand-crafted Cypress, Redwood, or Fir barrels. It has a high soybean con­tent in relation to the barley koji (grain inoculated with aspergillus spores). 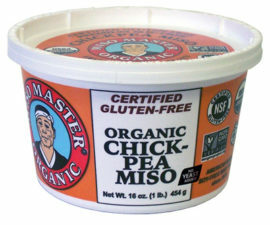 Because soy­beans are much more difficult to ferment, with their high protein and fat content, than the high-carbohydrate grains, this miso variety requires a prolonged aging period. This gives the aspergillus spores and lactobacillus bacteria sufficient time to completely break down the complex protein and fat molecules into their more digestible constituents. 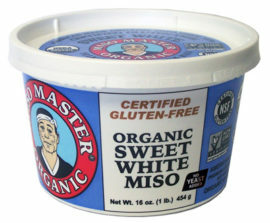 Long-Term aged misos also have a higher salt content which retards the fermentation so that the process moves gradually. 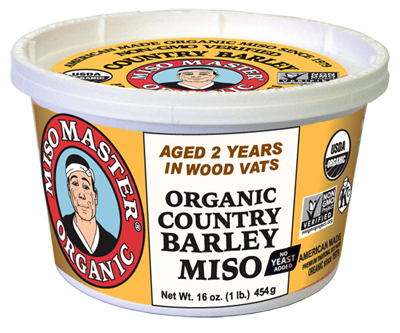 Miso Master Organic Traditional Country Barley Mi­so has a complex flavor profile that is salty, savory, and mildly sweet. These long-term mi­sos are the cask-aged Bordeaux Wines of miso. But the story does not end with just a rich taste,for these misos have their own special health benefits. Soybeans are the main source of the potent phytoestrogens known as isoflavones which have been shown to effectively combat degenerative diseases such as cancer, heart disease, and osteoporosis. All isoflavones, however, are not created as equally po­tent antioxidants. The isoflavones found in soybeans and unfermented soybean prod­ucts such as soymilk, tofu, soy supplement powders, soy flakes, and TVPare mainly iso-flavone glucosides, which cannot be absorbed intact into the human bloodstream. Only another isoflavone subgroup,the isoflavone aglycones -which include the famous anticancer powerhouses geninstein and diadzein-can be absorbed intact into the hu­man bloodstream. These isoflavone aglycones are found in meaningful concentra­tions only in fermented soybean foods such as miso, soy sauce (shoyu and tamari), tempeh, and natto.During fermentation as much as 90% of the isoflavone glucosides are converted into isoflavone aglycones. Long-Term Aged Misos also contain melanoidins, another powerful antioxidant group.These melanoidins are the pigments that give Long-Term Aged Misos their dark colors. Ingredients: Organic whole soybeans, organic handmade barley koji, sun-dried sea salt, Blue Ridge Mountain well water, koji spores.